It’s well known that the first Gen III Hemi engine made its debut in the Dodge RAM truck for the 2003 model year. That original 5.7 L pushrod V8 produced 345 horsepower when installed in the pickup. Then, for the 2009 model year, Chrysler made several revisions to the 5.7 L, all in an effort to increase power by managing airflow into the cylinders. First was what Chrysler termed Variable Camshaft Timing or VCT. VCT uses an oil control valve which either advances or retards camshaft timing. Cylinder heads were revised to increase airflow, and an active intake manifold was incorporated to adjust runner length to optimize torque and horsepower. All of these technologies can benefit from an increased quantity of colder intake air to make additional power, like that delivered by a 302-236 AIRAID MXP air intake system. The MXP air intake system represents the ultimate in AIRAID’s cold air induction systems and delivers higher levels of horsepower and acceleration gains for 2009 - 2012 Dodge Ram 1500, 2500, and 3500 models. This air intake starts with the replacement of the restrictive factory housing by a one-piece roto-molded air box that addresses all the shortcomings of the OEM design. Housed inside the air box is an AIRAID SYNTHAMAX air filter, with media that consists of an inner and outer layer of wire mesh for durable support of the filtration media as well as overall filter durability. The SYNTHAMAX filter media is comprised of two distinct layers of unique synthetic materials that when combined provides outstanding air flow and exceptionally high filtration at the same time. Air is directed through a new air intake tube constructed of cross-linked, high-density polyethylene designed using extensive computer modeling to maintain proper mass air flow readings and calibration. This MXP air intake system also features provisions for the factory crankcase vent tube. 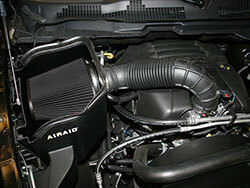 Installation of the 302-236 AIRAID MXP air intake system is fast and simple, with highly-detailed instructions. You need only a few basic tools and not more than a couple of hours to increase the power and responsiveness of your 5.7 L RAM. Maintenance of the 302-236 is simple: clean your AIRAID filter every 30,000 to 50,000 miles for normal driving, or more often if you’re driving off-road or in heavy dust conditions, with AIRAID premium dry filter cleaning solution, Part Number 790-558. And something not all cold air intake system manufacturers can claim: the 302-236 MXP air intake system is street legal in all US states with CARB EO number: D-609-18. 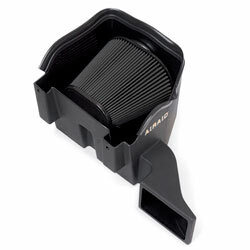 Plus the 302-236 MXP air intake system is backed by AIRAID’s “No Hassle” Lifetime Warranty, which is simple. If you are ever dissatisfied with the materials, workmanship, or performance of this air filter, call us at 800-498-6951 and we will be happy to assist you. You don’t have to worry about carrying around a warranty card; AIRAID filters are warranted for life.